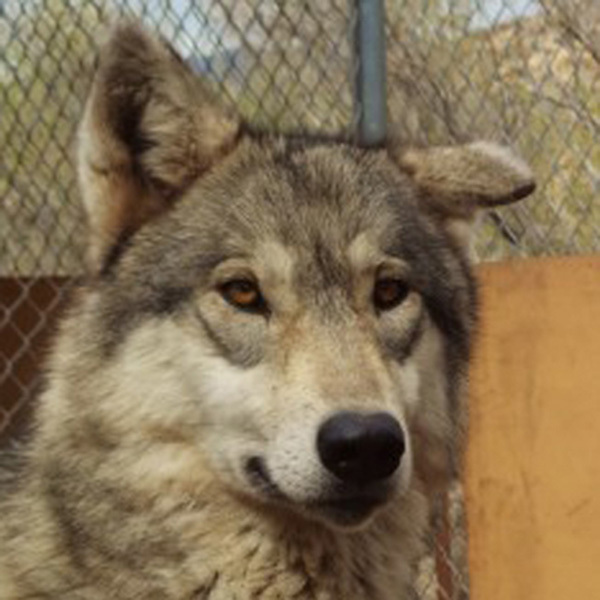 In the summer of 2012 Willow accompanied several Wolf Connection staff and wolves to attend a sacred council of the Thirteen Grandmothers in Lame Deer, Montana. The Cheyenne adored her and felt blessed by her presence. Looking into her eyes, one may be inspired to see pools of honey, dripping with purity and sweetness. Her presence is palpable and though it may require patience before she will allow new people to pet her and directly connect with her, and the experience is well worth the effort. Evidence of her high wolf content, she is shy and intelligent. Guests who allow the lesson of patience and respect have been rewarded with petting Willow and gazing into her eyes. She has the instinct of a tracker and the understanding of an omega in that she knows how to keep peace – especially when her kennel mate acts up!